TWP Stains are to be applied “Wet on Wet” when the wood is absorbent enough to handle more than 1 coat of the stain. 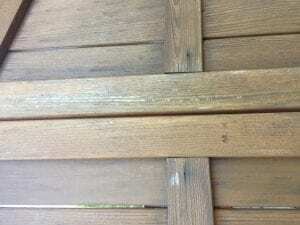 This is typically for wood and decking that is older than 12 months and has been exposed to the elements. Applying the TWP “wet on wet” is similar to applying 1.5 coats of stain. The second coat covers twice as much square footage as the first coat. Applying TWP “wet on wet” is very easy and not complicated once you understand the simple steps. Apply the TWP to the verticals first. This would include the railings, benches, and any vertical walls. Lightly apply one coat of stain to the horizontal flooring. Apply to the entire floor surface. If your deck has multiple levels, do one level at a time before moving to the next level. Wearing shoes that are disposable, walk back onto the “wet” stain and reapply another coat to the “tops” of and railings, walls, and benches. You may walk on your first coat of stain 10 minutes after finishing. Apply your second coat of stain to the horizontal flooring. Take care to not step in or leave footprints in your second coat! Finish stairs last, repeating the above steps. Do not apply 2 coats of stain to new wood or decking. In most cases, a second coat only needs to be applied to horizontals as the verticals will last twice as long. Apply your second coat of stain within 10-60 minutes of the first coat. Watching for puddling on the floor. This usually happens under railings and benches. Wear shoes and clothes that are disposable. 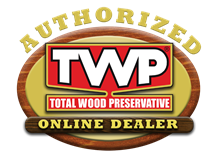 TWP Wood Stains can be applied with a stain pad, brush, roller, or sprayer. I applied TWP 1504 on my then-new deck 2 years ago. Need to reapply. There are some places on the deck that are lighter than others now. For example, the area under the table is darker as it wasn’t exposed to sun as much. What steps do I take to reapply and what if anything special needs to be done to account for the uneven wear? I have a 20 month old pressure treated deck that has never been stained. The deck looks aged can I put 2 coats on or should I still use 1 as you recommend for the first time? I have a new (6 months old) pressure treated lumber deck and considering the 1500. I’m confused about the wet on wet. Should the deck be wet for the initial coat or only still wet when applying the second coat? For the second coat, you apply it while the first coat has not fully dried. 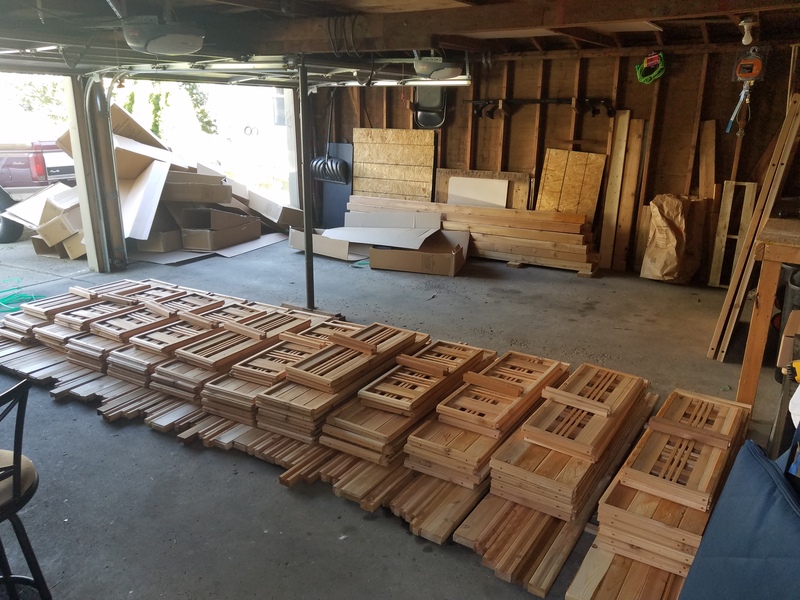 TWP 1500 or 100 stain for previously stained exterior cedar logs? The previous coating if not TWP will need to be removed. Once prepped correctly, use the TWP 1500 Series. And use the TWP 1500 Series. Coverage would be about the same as the SD. I’m applying 1500 Natural to a new redwood deck. Would you stain the railings or the decking first? I’m wondering how careful I need to be when staining the railings – will any drips that get onto the decking cause problems? If I stain the decking after, would those drips be less visible? Rails first and then the floor. Tarp floor to catch drips when doing the railings. When staining the deck floor should I use the wet on wet method (2 coats)? Yes, unless the wood is new or has a previous coating of TWP. There is a previous coat of TWP stain which will be cleaned and brightened before applying new stain. So for this I should use just 1 coat? Probably 1 but that can vary based on the prep as the cleaner may remove down to the bare wood if the current coating is heavily worn. What’s the difference between the 100 series and 1500 series stains? Clean and brighten with the Gemini Restore Kit. I’ve got a fir wood deck. I’m in the process of power sanding to take off the old surface stain. I will have it sanded down to new fresh wood. Was thinking to apply TWP 1500 Natural Color. How many coats will I need to apply? What should I use to apply the stain? Do not sand finer than 80 grit. Clean and brighten for the final prep after the sanding is done. Stain with one coat. I applied a wet on wet application of TWP 100 on my deck 2 years ago. It had no maintenance paint done last year. The paint looks good and even, but no longer beads and needs the maintenance done this year. I play to use the restore kit (cleaner + brightener). I am assuming one layer of paint is enough. Is this correct? That depends on the prep. If you still have TWP base layer after the prep, then just one coat. If down to the bare wood, do the two coats again. we just had one coat of 100 applied to our new deck. How long do we wait for it to be be dry? Also, what would be the earliest we could add a second coat if we are looking to make the color darker? If we switch to a darker color of the 100 do we need to remove what we have on there at that time or just put new color on top? You can do another coat in 6-12 months. If you want to go darker, you can use the Gemini Restore Kit for the prep. Dries in 24-48 hours normally but that depends on the weather. Remove excess stain that does not soak in after 1 hour or so and only if needed. Use rags. Make sure to saturate all oily rags in water and lay flat to dry outside, away from buildings. We stained our 26 year old deck with TWP 1500 after stripping and whitening it with Restore a deck. Came out beautiful! The horizontal part of the deck gets a great deal of sun and could be recoated next year. What would be the procedure to do it properly? A light cleaning with the Gemini Cleaner and one coat of the TWP. I’ve have 2 gallons of unopened TWP 120 (Pecan) that has been stored in our home, not garage, for just under 4 years. If shaken by machine, is there any reason that I shouldn’t use this stain? As long as it mixes evenly (no clumps) you should be kay to use. I am going to apply on a new deck after cleaning and brightening. Is the “wet on wet” technique consider one or two coats? I understand I should only apply one coat, but not sure if the second “wet” on a “wet on wet” coat would be considered part of the first coat or considered a second coat. Can you please clarify? We have a new deck that has never been stained so do we only APPLY one coat? I am ready to apply my TWP with a brush. What type of brush should I use? Use an exterior stain pad. It works much better than a brush. I just cleaned and brightend a 2 year old PT wood fence behind my shop. I also just purchased a few gallons of the TWP 100 to be apllyed this weekend. Do I need 1 or 2 coats of stain on the fence? I have enough for 2 coats but was wondering if applying to a fence should take 1 or 2 coats? Do the two coats wet on wet. I have a 25 year old cedar deck in Seattle. It’s generally been well cared for. Last year I sanded it completely and foolishly applied a water based Behr deck product that went on like paint and has worn really poorly with lots of flaking and peeling. I plan to re-sand the whole deck this month and use your 100 series product. If I am going to sand all the old stain off, do I need to use any of the deck cleaner or brightner products or can I just re-stain after sanding? Yes. After the sanding, use the Gemini Restore Kit for your final prep. Can the second coat of a wet on wet stain be applied the next day? I was pulled away before I could finish. It may not set up properly if the second coat is applied to a dry coat the next day. This will vary though based on the porosity of the wood. It needs to be installed first. My husband and I just applied the first coat of TWP to our new deck. The wood has been aging for 7 months. After about 12 hours, it just spontaneously rained for 30 mins. Is there any protocall if this happens? We checked the forecast and thought we were in the clear but it’s been a surprising rainy season. Any suggestions would be greatly appreciated! I just had painter reapply TWP to a fence gate that had been previously done about 3 years ago. Now that they are done, there are some spots that seem more bare than the others. They completed this two days ago. I want them to go over the spots that look lighter. What directors should I give them? I also seem to be out of stain and may need to wait for more to arrive (I have a little leftover from 3 years in a can). Best to not spot apply and it the lighter spots are around the knots, this is normal. Feel free to post a picture. Tell them to do the entire board length for each board that has a missed spot. That way it will not look like you “spot” treated it. Do you know what may have occurred in the application process to create these bare spots? To us, it looks like they missed that entire whole area around those missed spots on each of those boards. Doesn’t look like it was cleaned properly before restaining. My deck is approximately 11 months old. Made from pressure treated lumber and I live in MD which is relatively humid. I applied the treatment/brightener over the weekend and one (1) coat of stain yesterday afternoon. Got too dark to apply a second coat. I am assuming my deck falls under the “new” category and should not need a second coat. Is that correct? If I do need a second coat will it be an issue to apply 10 days from now? Forecast is showing rain every night starting tomorrow. Yes, leave as is with the one coat. Do not apply a second coat now. You can always do a light wash and recoat in the Spring of next year if needed. Per your previous response, it appears that for a deck over 12 months old (mine is 16 months old) and is not stained, it should be considered new and apply one coat. How long should I wait to apply the second coat? Wet on wet as the article above states is the proper way to apply for your 16-month-old deck. Apply your second coat of stain within 10-60 minutes of the first coat. For the purpose of planning how much stain to buy, does a two-coat “wet on wet” application really require double the amount of stain? Or to ask it differently, does the second application usually require as much stain as the first? The second coat covers roughly twice the amount as the first coat. For the TWO coats applied wet on wet, you will get roughly 100-125 sq feet per gallon. 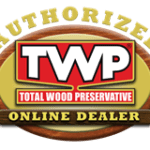 We have prepped our several year old cedar deck for TWP by using a deck cleaner/brightener, sanded the entire deck down with 40-60 grit sandpaper and a random orbital sander to remove any remaining non-TWP coating, and then cleaned again with cleaner/brightener. We are now ready to stain. The sanded wood has been exposed for a couple weeks now. Do you think this will take one or two coats of stain? This will be TWP-100 series in Minnesota. Thanks! Two light coats applied wet on wet for this. I just had a pergola installed. Treated pine wood from home Depot a month ago? Is it ready to be stained? Do I apply once or twice? Thanks! We just finished installing a new cedar deck. Do I still use the ‘wet on wet’ method for new cedar wood that has never had anything applied to it? It sounds like I only need to apply 1 coat to new (raw) wood. Also is there any truth to letting the wood weather for a few months before applying stain? Our cedar was kiln-dried. Thank you. How do I removed spilled stain (slight amount) from a concrete floor? Use a graffiti remover cleaner and pressure washing. What should I use to clean my applicator with after staining with the TWP 100? We just finished staining a deck (that was pressure washed and very dry). We used the wet on wet process and may have over-stained. 24 hours later the deck was tacky, slippery and very shiny in some places. We read other suggestions to use mineral spirits to remove the thick or shiny areas. As we were doing that some of the areas started to create “pill balls”. We then used a broom to sweep these off. Will this deck dry? It sounds like it was really over applied if doing this. Continue to remove the excess and then leave it alone for a few days. It should be okay. Careful with those oily rags! if my deck gets rained after 24 to 36 hours after application will it hurt the stain. it feels dry to touch after about 6 hours. 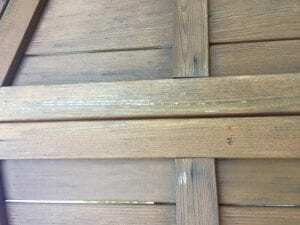 Do you recommend staining the underside of an elevated deck? And if so, what technique? Only reason to do this would be for appearance. Use a stain pad. I have a 20 year old deck that I applied Sikkens stain to every year after letting wood age for a year. Just sanded the entire deck, wood looks brand new. Live in Norther VA so plan on 1500 series. Can I apply wet on wet to the horizontal boards and single coat as described. Is brush or pad better way to apply. Stain pad is best. Do a two coat wet on wet application. I installed my treated pine fence last Aug. It is now 10 months later. 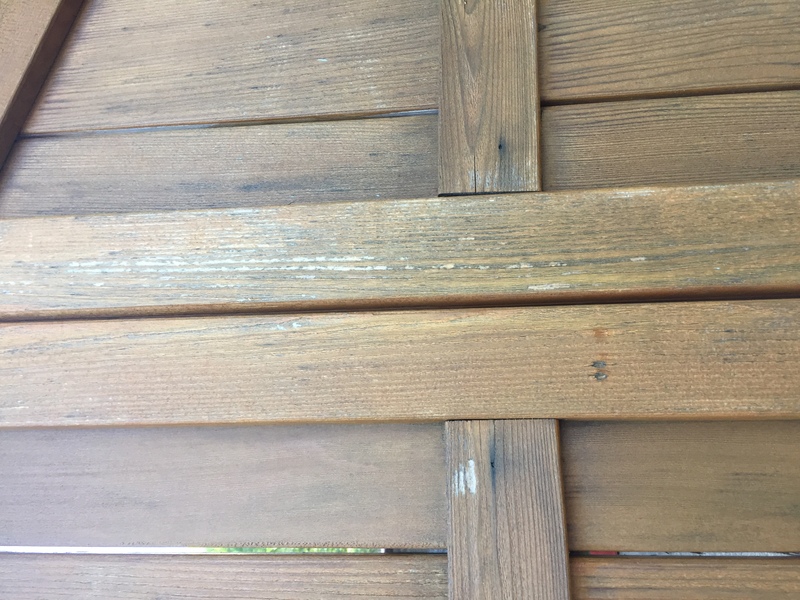 Do I need to pressure wash the fence and deck prior to staining? Will the fence take 1 coat or 2 to stain? 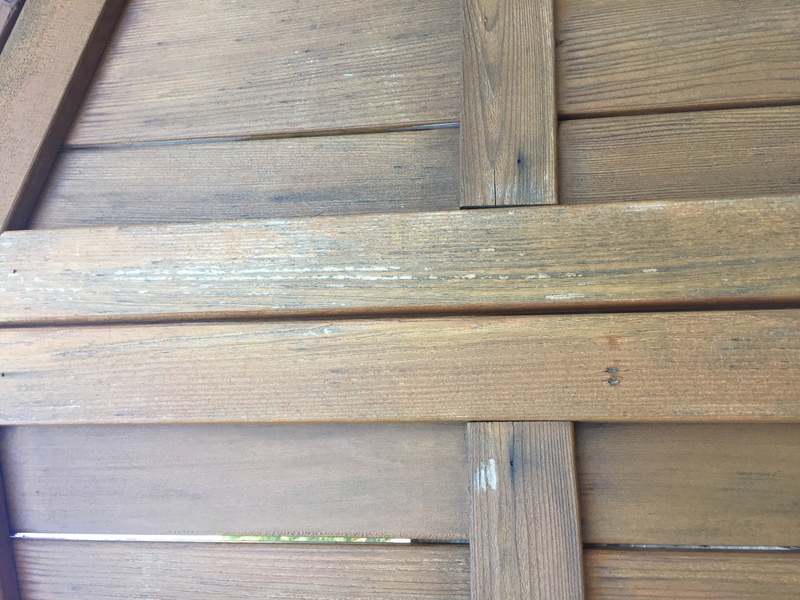 Can I apply stain to a fence that may be damp or should I wait a few days and let it dry out? Prep with the Gemini Restore Kit and pressure washing. Apply the two coats wet on wet. The wood cannot be damp when applying the stain. My (old wood) deck is all clean and ready to stain. I am applying TWP 1500 to it with a brush. It’s about 160 square feet. Is It okay for me to apply stain to a few boards at a time–doing the two coat, wet-on-wet treatment and work my way across the deck? Rather than trying to do the whole first coat at one time, and then the whole second coat? I don’t think I could get the second coat on in time if I tried to do it all at once. Thank you! If you use a stain pad you could do the entire 160 sq feet of flooring in about 10 minutes. It applied better than a brush as well and you do it standing up when you attach to a pole. I would highly suggest using one of these. To answer your question, yes you could do it this way but it is not optimal. You can try to lightly recoat all and hope it soaks in evenly and without it being over applied. If that does not work, you will need to strip it off and start over. Have applied single coat of TWP 1515 Honeytone sealent to a now 20 year old cedar deck. It seldom lasts more then two years. Will a wet to wet application of two coats last twice as long? I also remember trying to apply a wet to wet process and found it very difficult to apply the second coat prior to the first coat being try( it became sticky and took long to dry). How can you tell when to actually apply the second coat? No, it does not lays twice as long but it will last longer. Almost always needs a second coat unless the wood is new or you are applying a light maintenace coat annualy. Can I use TWP on an oak door that has been stripped and sanded? You should be able to but the TWP cannot be top coated like many doors are. No. Just leave as is. TWP is actually not supposed to bead water but shed water so it seems you may have over applied in the areas that is beading. Should not be a big deal though. Only had enough time to do one coat on a deck before dark, couldn’t do the wet on wet application. What is the best course of action to get a second coat? Will it last OK with just one coat? Leave as is for now and do a light coat in the Fall. For the prep, lightly rine with soapy water to remove any dirt. I was interrupted while staining and have a portion that didn’t get the second wet-on-wet coat. It looks noticeably lighter. can I apply a second coat to this area after it dried? It would be best to not do this right now. Wait until Fall and light wash to remove the dirt and apply the coat then. Hi, I had 50 year old cedar poles sawn and made a deck out of it. The whole deck is rough sawn except the deck floor is smooth. What is the best TWP product to use on this. The 1500 series or the 100 series? Should I use one product on the rough sawn and one product on the smooth floor or what do you recommend? Thanks. So even if the wood was old and dried out prior to milling, I should still let it weather for the 4 months? And the 100 series is what you recommend for the whole deck? That is correct. 100 or 1500 depending on if your state is limited to certain VOCs. The 1500 series has offers the natural color I like, but its reccomending 100 series in which I would get the cedar tone. Is there a big difference in color between the two, and if I went to the 1500 series what are the drawbacks as compared to the 100 series? 101 Cedatone Natural is basically the same color as the TWP 1530 Natural. What will happen if I stain fresh wood? I have a lot of boards that will be replaced on my 8 year old deck (yay for behr acrylic!). My deck needs to be refinished and stain this season. What is the worst that will happen to the new boards? Couldn’t I resand them by hand next year when I do an update coat on the entire deck? Worst case scenario for not letting your new wood season is that you will strip and redo the entire deck next Spring. Spot sanding for prep will not work and sanding, in general, is not the best way to prep. Yes, you can sand to remove the Cabot. Use a stain pad or brush to restain the door. 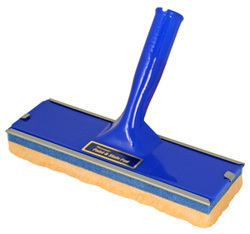 Use a stain pad over a roller. Much better application and it allows you to “push” the TWP into the wood grain.